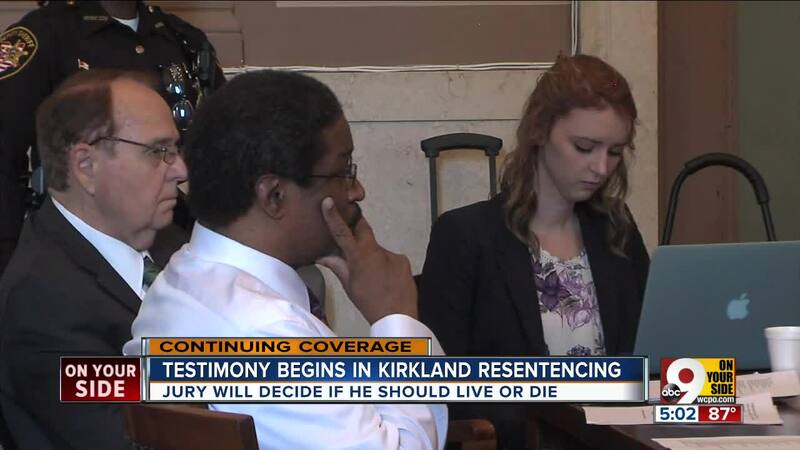 CINCINNATI -- Anthony Kirkland’s defense will make the case that serial killer is mentally ill and therefore should not be sentenced to death in the brutal rapes and killings of two Cincinnati teens, Kirkland's attorney said Wednesday. Attorney Tim Cutcher, outlining his defense in opening statements in Kirkland’s resentencing hearing, told jurors their decision should boil down to how they answer one question. "How could a person of seemingly average intelligence act in a manner described by the prosecutor?" Cutcher said. “There’s a statutory mitigating factor that says you shall consider whether as a result of a mental disease or defect the defendant was unable to control his actions and conform to the law. “Mr. Kirkland was not able to do that,” Cutcher said. "The defense is seeking life without parole." Cutcher said a defense expert would testify that tests on Kirkland's brain showed "five standard deviations" and that the expert regarded them as "abnormal results." The first full day of the hearings started with jurors visiting the Winton Hills reservoir area where Kirkland attacked 13-year-old Esme Kenney while she was jogging alone, strangled her and burned her body on March 7, 2009. Kirkland is also being resentenced for the 2006 killing of 14-year-old Casonya Crawford. Crawford's body was also burned. Gruesome photos of the burned bodies were shown in court, over the objection of Kirkland's defense. Cutcher said they could unduly prejudice the jury. However, Judge Patrick Dinkelacker said he didn't believe seeing the photos would override Kirkland's due process rights, and noted that they had already been used in the trial and gone through the Ohio Supreme Court. "It would be my inclination to admit them," Dinkelacker said. In seeking the death penalty, Prosecutor Joe Deters described the brutality of the attack on Kenney Wednesday as "almost incomprehensible." He said Kirkland hit, kicked and stomped the girl. Then Kirkland sexually assaulted her and choked her because he didn't want any witnesses. "The bottom line is this: he is a vicious serial killer," he said. Deters said police found Kirkland the next day in a wooded area near Kenney's body. "He's sitting on the ground against a tree. Officers see knives coming out of his pants. They see her pink iPad which read, 'Property of Esme Kenney,'" Deters said. "She ran into the woods with him chasing her. She promises she won't tell if he would just let her go." Cutcher countered that the mitigating factors would outweigh the aggravating factors in the killings. Cutcher said bipolar disorder, Kirkland's abusive upbringing and a fracture from a 2004 bicycle may also have been mitigating factors. Since Kirkland’s 2010 conviction stands, the jury is only deciding the sentence – death or life in prison. If the jury chooses a life sentence, they must also decide whether Kirkland will be eligible for parole after 25 or 30 years or never. Cutcher said Kirkland "tried to get help and it's something we want to you to consider." He said Kirkland made eight trips to the emergency room between Nov. 29, 2008 and Feb. 28, 2009, to try to get admitted to the hospital in the months before killing Kenney. Testimony began after opening statements with Crawford's grandmother, Pamela Crawford, first to take the stand. Jurors will hear from other family members of the victims. Police Sgt. Howard Grant testified that Crawford's body was found under a pile of tires and trash at the end of a deadend street used as "a dumping area." Her body had been burned and was only identifiable by dental records, he said. Howard had also worked on the case of Mary Jo Newton. Kirkland was convicted of murdering her before he was tried for Esme's and Casonya's deaths. In 2006, Newton's body was found about a half-mile away from where Casonya's body had been found, Howard said. It was also a dead-end street used as a dumping ground in the same neighborhood. Her body was also burned. "That scene was very similar," Howard said. The 12-member jury, seated Tuesday, consists of six white men, four white women and two black women. The four alternates include two white women, one black woman and one white man. Cutcher said he expected the hearing to last through next week and possibly until Aug. 6. In a death penalty sentencing, the defendant can make an un-sworn statement. That's what Kirkland plans to do, according to Cutcher. Kirkland did the same thing during his 2010 sentencing. 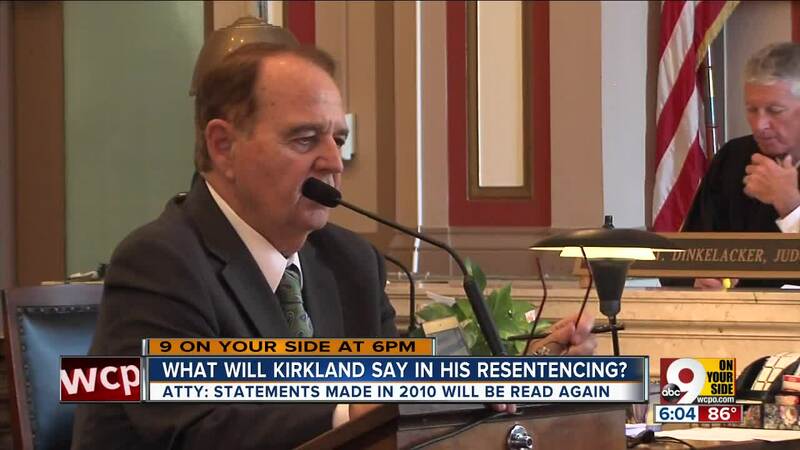 "I cannot believe how horrible I am," Kirkland said then. "... I hope I am locked away forever." Jurors will also hear Kirkland’s nine-hour interview with police after he was arrested for killing Kenney. Kirkland was convicted of killing the girls and sentenced to death in 2010, but an appeals court later tossed out the sentence because of a comment Deters made during sentencing. Deters said Casonya and Esme would be “just freebies” for Kirkland unless he got the death penalty, since Kirkland was already serving life without parole for two previous killings. Court adjourned for the day at about 1:30 p.m. The hearing will continue Thursday morning.